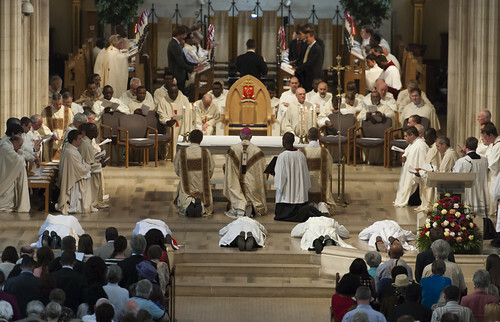 The photograph above shows a very special moment in the life of our diocese: the ordination of five men to serve God's people as priests. At this moment in the rite of ordination they are lying prostrate on the floor while the whole congregation kneels and seeks the intercession of the Saints. Afterwards the Archbishop will stand to face them and pray the prayer of consecration. This ordination brings to a total of seven the number of men ordained at the Cathedral for the Archdiocese this year. Fr Samuel Davey from the Good Shepherd Parish in NewAddington. Fr Valentine Erhahon from the Holy Ghost Parish in Balham. Fr Stephen Haines from the Cathedral Parish. Fr Thomas Lynch from St Bede's Parish in Clapham Park. Fr Leonard Tatt from Christ Church Parish in Eltham. Please pray for our new priests. When was the last time there was an ordination from your parish? From next term we will have a number of young men ready and willing to speak about the need for vocations in your home parish. Just contact the Vocations Centre for more details. Wonderful moment in the life of the Church and our diocese. We will pray for more vocations in our parishes. What are you doing later this month?